"From those to whom much is given, much is expected." — hannah brencher. I want to bring 100,000 souls back to life. But I cannot. Not even 100. Not even one. I have sat in front of the TV for the past three days, my eyes fixated on the screen that shows me image after image of the devastation that has overcome Haiti's capital city of Port-au-Prince. I feel like I know these people. Perhaps because they are not much different than me. They still laugh at the sun, cry when in pain, kiss the ground for fortune and seek to understand why we walk this earth. Just like me. What separates us? A few borders and a word called economics. In the past few months I have applied to service programs for the upcoming year. One of the programs that I have interviewed for is a Catholic grade school in Port-au-Prince, where I would be teaching for 10 months. The same city that sits battered and restless on every news station right now. So I cannot help but see the tragedy that has struck and beg the question: Why? Why these beautiful people? Why this country? Why any country for that matter? I wonder why this had to happen to a nation that cannot stomach the after math. These people live in 4th world living conditions. Scrounging for food and water is a daily exercise for them. They beg for people to take their children so that they will a chance at a better life. Can you imagine having a child and loving him or her so much that you give them up because you cannot give them anything? Imagine how your heart might break to see that you cannot given even basic necessities to your child. The lady who interviewed me for the program said almost nonchalantly, "a child is more likely to die of malnutrition in Haiti than to get an education." And here I am. Sipping a cup of coffee that costs four dollars. Enjoying the care free life a college student. Getting frustrated when my computer does not load quick enough for my Millenial standards. Crying over passports, too much to do, spilled milk and other "Grown Up Obligations". Now I won't let this realization go to waste. I will learn from it. If you have a little money in the bank or spare change in a dish someplace…you are among the top 8% of the world’s wealthy. If you can attend a church or political rally without fear of harassment, arrest, torture or death…you have the kind of freedom denied to more than three billion people in the world. If your everyday problems are weighing you down, there are millions of people on Earth who would gladly trade places with you right now – problems and all – and feel they have been royally blessed. Remember: "From those to whom much is given, much is expected." We have it good, really good, better than we can even imagine. We wake up every day and we go to the cabinet to get some food and if we are out we simply head to the grocery store and fill up a cart. That is absolutely amazing people. We have the luxury of driving from place to place, of washing our clothes when they get dirty, of bathing ourselves in hot water and of knowing that more than likely we will see our loved ones in the morning. We are blessed and we should never forget it. A Place To Call Home. Loved Ones. Friends. Laughter. Good Food. Warmth. Money. Ambition. A Whole Family. Technology. Clean Water. Conversation. Luxuries. Education. Safety. Arms & Legs & A Beautiful Face. A Voice. A Heart That Is Not Broken. Keep counting until the day is done. What will you do today to appreciate your blessings? 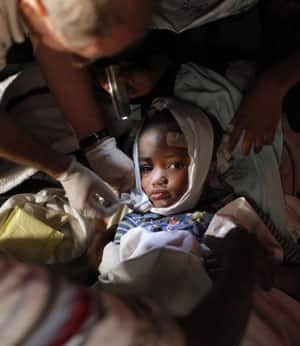 Haiti needs our help. Please act/ pray/ donate/ give/ think/ accordingly. Thank you.